This is the big smoker variation of an East Asian classic. The smoke from the tea leaves adds a distinct flavor to the chicken that is just fantastic. Combine wine, salt, brown sugar, and peppercorns in a large bowl. Cut scallions into 2 inch long pieces and flatten with the side of a cleaver. Add scallions and ginger root to bowl. Place chicken in bowl and rub the mixture all over the chicken inside and out. Let marinate in the refrigerator overnight. Prepare smoker. Remove chicken from marinade, placing scallions and ginger root inside. When the smoker is up to temperature (about 250 degrees F/120 degrees C) place chicken inside and place 1/4 of the tea leaves on the embers. Let smoke. Add tea leave 1/4 at a time every hour. Remove chicken from the smoker when a thermometer in the thickest part of the chicken breast and thigh reads 170 degrees F/75 degrees C. Remove from heat and let rest for at least 5-7 minutes. 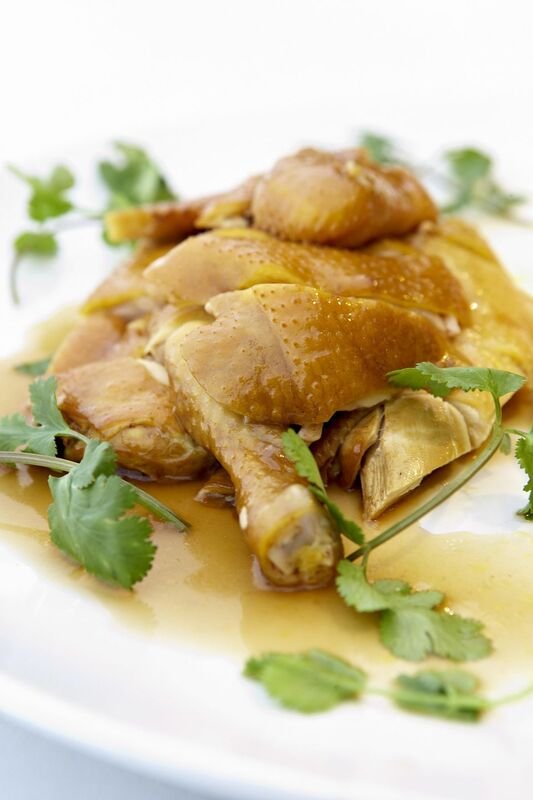 Brush the surface of the chicken with sesame oil cut into serving pieces and serve.